Donna, I and Tucker made a new hike to the Starvation Creek Falls using the 2.5 miles round trip loop. There are four waterfalls near the Starvation Creek Rest Area. 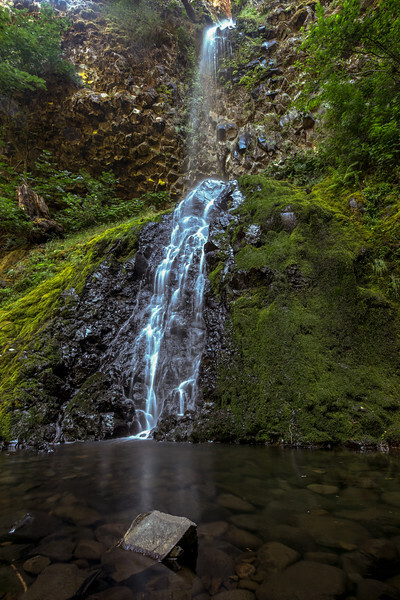 Starvation Creek Falls is easily reached by a short trail right at the rest area. The other three waterfalls are all accessible from the lower reaches of the Mount Defiance Trail. Starvation Creek Falls felt like one of those obscure waterfalls that probably wouldn't get quite the publicity and notoriety that other roadside attractions would get in the Columbia River Gorge area. Perhaps it was because most visitors wouldn't go far enough east (this one sat between Cascade Locks and Hood River). Nonetheless, this very tall waterfall was quite attractive, and definitely worth a stop. 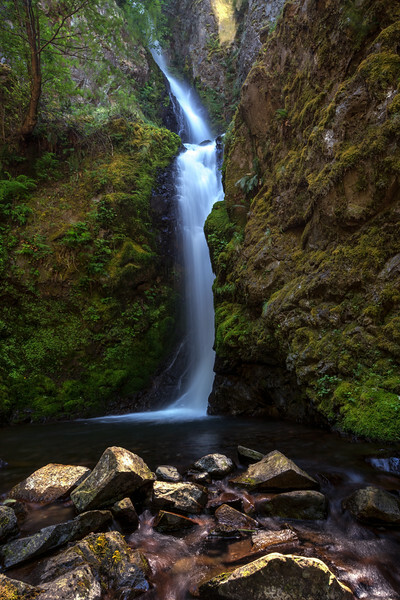 Starvation Creek, with its spectacular 186-foot waterfall, flows north a few miles from Viento Ridge into the Columbia River, about eight miles west of Hood River in the Columbia River Gorge. The descriptive name refers to an 1884-1885 event when a Pacific Express passenger train was trapped near the creek in snow from a blizzard for twenty-one days, from December 16 to January 6, 1885. With 148 passengers aboard, the Pacific Express left The Dalles but failed in its first attempt to reach Portland. On an attempt the next day, it joined with a train from Umatilla, two trains from the Northern Pacific, two from the Short Line, and the ORN locals. The three-engine Pacific Express traveled about two miles beyond Viento when it ran into a twenty-five-foot-deep snowslide. The trains’ crews and passengers soon discovered that they were blocked from behind as well. After many hours of passengers and crews shoveling the blocking snowslides, the crew was able to back up the trains over a trestle. News of the snowbound trains, which had little food on board, was reported daily in the Portland Morning Oregonian, and the train became the object of numerous relief attempts. Before long, over a dozen rescue engines were scattered along the tracks as the heavy snow kept falling. The trains’ coal supply was soon exhausted, and wooden seat frames were burned for heat. With food growing alarmingly scarce, the conductor ordered most of the able-bodied men to walk to Portland. About eighty men, many with their feet wrapped in towels, left the trains in extreme blizzard conditions to make their way to the city. Many walked all the way to Portland—approximately fifty miles—and a few stayed at Cascade Locks, about eleven miles away. Others caught up with the Portland shoveling crews and snowplows to hitch a ride back with them. From Hood River, a crew of men were paid $10 a day to pack food to the trains. More than eight hundred men from Portland, working for $2.50 a day and board, shoveled snow from the west end of the Gorge. At about the same time, news stories reported that two passengers had starved to death and that smallpox had broken out. Neither report was true. 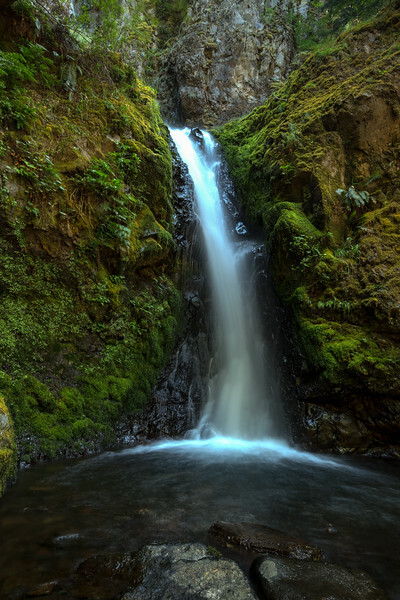 On January 6, workers broke through the last snowslide at Oneonta Falls, between Horsetail and Multnomah Falls. The Pacific Express, along with several trains that had been waiting in The Dalles, chugged down the tracks, now with over four hundred passengers and crew members aboard. The trains labored down the final stretch, through Sullivans Gulch in Portland to the transfer ferry on the Willamette River and finally across the river to the Ash Street Station. The passengers who swarmed into the brightly lit ticket office had spent three chilling weeks snowbound on a railroad trestle on the Columbia River. The stranded passengers and crews were often cold and hungry, but no one starved, died, or was lost. The little stream near the place where they were trapped was originally called Starveout Creek; it later became Starvation Creek. The area is now the Starvation Creek State Park. 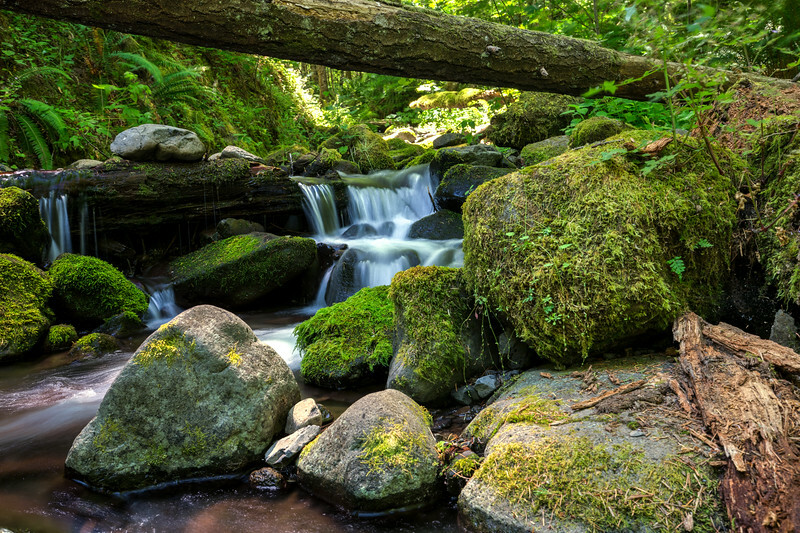 Cabin Creek Falls is the first fall encountered along the Mt. Defiance trail. The falls drop from a razor thin crack in the adjacent cliff, bouncing once on a small shelf, then dropping to the trail. The falls are situated no more than 50 feet from the trail, and can easily be seen without much effort (more so when the surrounding trees are bare). However, there are a pair of large rocks, probably 75 feet tall, sitting right in front of the falls, blocking the best perspective, so, seeing the entire falls clearly is a near impossibility. When the surrounding trees are bare, one can see almost the entire falls from the trail, the upper tier more or less alone, and the lower tier by itself, but thanks to that dastardly boulder, never together. There is a scramble path that leads to a small saddle between the two boulders, from which I achieved a different perspective, however you'll need a super wide angle lens to get a complete shot. The falls can also be seen well from Interstate 84, though, again, not in it's entirety.